I’m Iro! I am from Machadinho, Rio Grande do Sul, Brazil. I moved to Washington, DC in 2009. Since moving to DC I’ve been lucky and fortunate to be working in the animal care field. 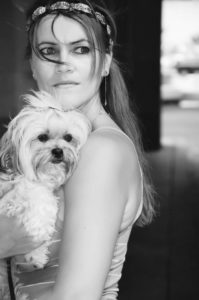 I have worked as a dog walker, pet sitter, dog trainer, and with dog rescue organizations. My experience has given me the knowledge and familiarity of dog’s personality and behavior. My best friend who I call my son is my little boy “Whiskey”. Whiskey is a ShihPoo mix and has filled my heart with unconditional love since I adopted him in 2009, at one year old. He is one of my inspirations for becoming a Pet Photographer. My Love for animals goes way back before coming to Washington DC. Growing up I had dogs of many breeds that became part of my family. I lived in Porto Alegre Brazil, a country that has many lost and abandoned animals on the street. There, I also worked to help animals, rescuing dogs and cats, getting them veterinary care and finding them homes. Also, I have studied Public Relations and International Business. I owned a Cafe and Spa called Cafe com Pe, where I met my husband Valter who supports and encourages my animal work. I’ve continued to feed my love and dedication to animals as a volunteer photographer for local animal rescue organizations in DC. Your pet and you are welcome in to have a glorious fun moment.